So I'm finally posting about my side-car solution. I've been asked about how I made my side car so here is the how. First thing is that we bought a convertible crib. We bought ours at Babies r us but that is neither here nor there. Convertible cribs are great for this purpose because they are made to be used without the front. Normally you would do that to make the toddler bed but hey it works for this too! 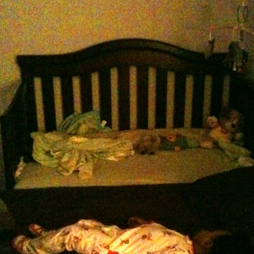 Third you need to see how much of a difference in height there is between your bed and the crib mattress. There are a couple of ways to deal with this. My solution was to use bricks under the crib legs. Many people go to the craft store and buy foam cord cut to the right measurements. It may take several layers so you'll have to measure and measure before you buy. I had extra bricks so I just used what I has on hand. 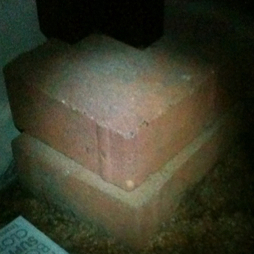 I know the picture isn't great but you can see that I have two bricks on top of each other. I have done that for all four legs. The next step is actually pushing everything together or if you are good without the measuring tape you can measure to find the gap between the crib mattress and your bed. Remember that you have removed the front of your crib so you will have a bit of a gap. My solution was to roll up towels and placed them on the side next to the wall. That keeps the crib mattress from sliding and leaving a gap for baby to get caught in. This is super important. You cannot have a gap! The most important thing is baby's safety. I have seen that some people will create/make a special blanket that covers the seam between the crib mattress and your bed. Now that Audrey is older I don't worry about the seam but when she was younger I would lay a blanket across the seam. 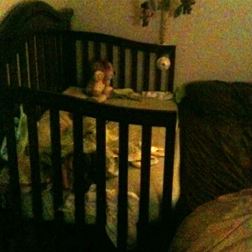 Again the picture isn't great but you can see that our bed is brown and her crib is green and they are touching. It looks like there is room between the two but I think that is the crappy picture because trust me I struggle to change the sheets since it is so tight between the two. The final step is using it. It does take time to set up but it is well worth the effort. I know many people buy an arm's reach co-sleeper and then a crib. Why spend the extra money? The convertible crib and be sidecared and then it can be your toddler bed or your child's full size bed frame. But again you have to do what is best for you. If you have any questions or tips to add feel free to leave them in the comments and I'll try to add them to the post. Others have great write ups on putting together a side car. Google them up and see the variety that is out there. Honest it's not that hard. So one last pic, you can see Audrey is sleeping in our bed. Most nights she uses her crib but she ends up in our bed for a few hours each night. We love it. Audrey has her space and we have ours but every night we are together.